For example, if the marginal propensity to consume out of the marginal amount of income earned is 0.9, then the marginal propensity to save is 0.1. With this relationship in mind, consider the relationship among income, consumption, and savings shown in Table 1. In Table 1, for each increase in income of $1000, consumption increases by $800. Thus, the marginal propensity to consumer (MPC) is 0.80. Any additional income which isn’t spent is saved, so for each increase in income of $1000, saving increases by $200. The MPS is 0.20. The pattern of consumption shown in Table 1 is plotted in Figure 1. The relationship between income and consumption, whether in tabular or graphical form is called the consumption function. Both the table and figure illustrate a typical consumption function. There are a couple of features to observe. First, consumption expenditure increases as income does. For every increase in income, consumption increases by the MPC times that increase in income. 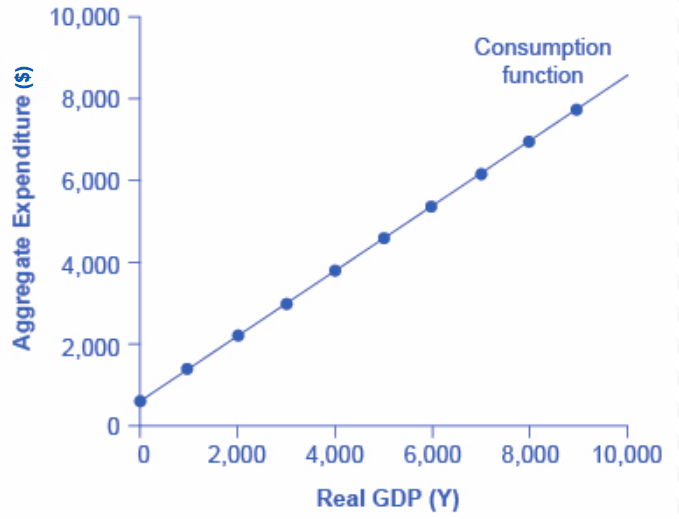 Thus, the slope of the consumption function is the MPC. Second, at low levels of income, consumption is greater than income. Even if income were zero, people would have to consume something. We call the level of consumption when income is zero autonomous consumption, since it shows the amount of consumption independent of income. In this example, consumption would be $600 even if income were zero. Thus, to calculate consumption at any level of income, multiply the income level by 0.8, for the marginal propensity to consume, and add $600, for the amount that would be consumed even if income was zero. Figure 1. The Consumption Function. In the expenditure-output model, how does consumption increase with the level of national income? Output on the horizontal axis is conceptually the same as national income, since the value of all final output that is produced and sold must be income to someone, somewhere in the economy. At a national income level of zero, $600 is consumed. Then, each time income rises by $1,000, consumption rises by $800, because in this example, the marginal propensity to consume is 0.8. A change in the marginal propensity to consume will change the slope of the consumption function. An increase in the MPC steepens the consumption function; a decrease in the MPC flattens it. A number of factors other than income can also cause the entire consumption function to shift. These factors were summarized in the earlier discussion of consumption. For example, changes in consumer expectations about the future, or changes in household wealth would cause the consumption function to shift up or down to a a new consumption function that is parallel to the original one. Watch the selected three-minute clip from this video to take another look at the consumption function and the marginal propensity to consume. Note that his graph is a rough sketch and not drawn entirely to scale. Watch this next video for more practice in graphing the consumption function. Then take it a step further to analyze what kind of impact an increase in income will have on consumer spending.